While building a section you will no doubt want to move things around as you work. To this end, patterns can be manipulated as discrete objects. In addition, arbitrary groups of drums — as they exist within the beats of one or more bars — can be handled independently of their containing patterns. A pattern selected as a whole. To do something with a pattern as a self-contained unit, click in its top area to select it. You can now Cut or Copy (from the Edit menu), and then Paste it elsewhere. Choosing Clear will delete the bar. To select several patterns at once, hold the Shift or Command keys. You can also simply drag and drop patterns using the mouse to move and rearrange them. Hold down Option to make a copy. A pattern with two beats selected. To select a region witihin a pattern, move the mouse to the pattern's lower edge (or in between beat subdivisions), and it will turn into an I-beam cursor ( ). Click and drag to highlight a selection, or Shift-click at another place to select a region bounded by the insertion point location. You can also quickly select a beat subdivision by moving the mouse near its top area so that it turns into a triangle cursor ( ), and then click or drag like usual. You can Copy your selection, and if you Cut or Clear the selected events will be lifted from their patterns. Choosing Paste will put the copied events into the target pattern, replacing any content beginning at the insertion point (or current selection). If instead you wish to combine the copied events with the existing material, hold the Shift key in order to Paste Over. In the lower left of the document window, the section list houses the building blocks of the song. Each section contains its own group of patterns. To edit a section, select it from the list. Its patterns will be displayed in the pattern editor. To create a new section, click or choose Add Section from the Song menu. To delete the highlighted section(s), click . The Name column shows a descriptive name (click to edit). 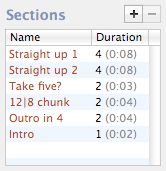 Duration indicates the section's length, in number of bars as well as minutes and seconds. The order of sections in the list is irrelevant, but the song must contain at least one. 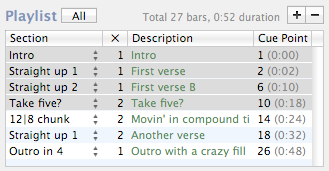 Sitting beside the section list, the playlist represents the structural road map for the song. Each entry in the playlist describes a section to be played one or more times. The song begins with the first item in the playlist, and continues sequentially. The playlist, with four entries selected. To add an entry to the playlist, either click , choose Add to Playlist from the Song menu, or simply drag over an item from the section list. To delete a highlighted entry, click . Playlist entries can be re-ordered by dragging and dropping them. The Section column indicates which section will be played for this entry (click on it to change). The field labeled × specifies how many times it will be played in succession. Description is an arbitrary label (e.g., "reprise of first verse"). Cue point indicates where the section begins in the song, in terms of bar number as well as minutes and seconds. To edit the section belonging to a playlist entry, select it in the list and its patterns will be displayed in the pattern editor. To view the entire song at once, click . This will select the whole playlist.